Just a few simple tweaks can take your grilled cheese and tomato soup to a whole other level. Three kinds of cheese melted to perfection and cream instead of water in the soup really amps up the flavor. This can be thrown together in about 30 minutes or less. This recipe is perfect for those days that you just don’t feel much like cooking. Quick and easy doesn’t have to mean bland and boring. Pour the 2 cans of tomato soup into a sauce pan (do not add water). Pour in heavy cream and mix until well-combined. Add parsley flakes and stir. Heat on medium heat, stirring often, while you prepare the sandwiches. Brush one side of each piece of bread with melted butter. Place 1 slice of each cheese between 2 pieces of bread (place the cheese between the non-buttered sides). If you don’t have a press, place the sandwich in a skillet on medium/high heat, flipping to brown on both sides. Cut the sandwich in half, pour the soup into bowls (top each bowl of soup with a few more parsley flakes if desired), and chow down. This recipe makes 2 sandwiches and 2 bowls of soup. You can use milk or half-n-half for the soup if you don’t want to use heavy cream, but the cream really gives it the texture and flavor that makes this so amazing. These three cheeses together produce something magical. You’ll wonder why you ever used processed cheese slices. 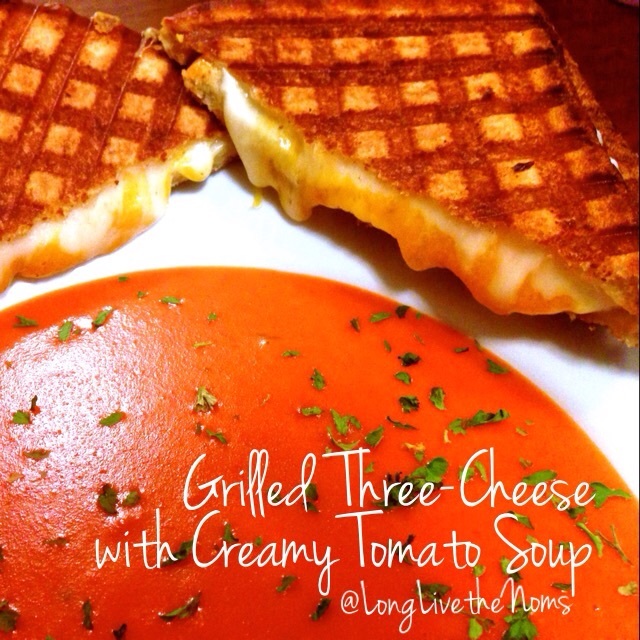 Posted in Dinner, LunchTagged cheddar, cheese, classic meals, dinner ideas, easy recipes, gouda, grilled, lunch ideas, muenster, quick meals, sandwich, soup, tomatoBookmark the permalink.